Food retail prices in February showed slight improvement from January, including a return to inflation in the dairy category, figures from the Bureau of Labor Statistics released Wednesday showed. 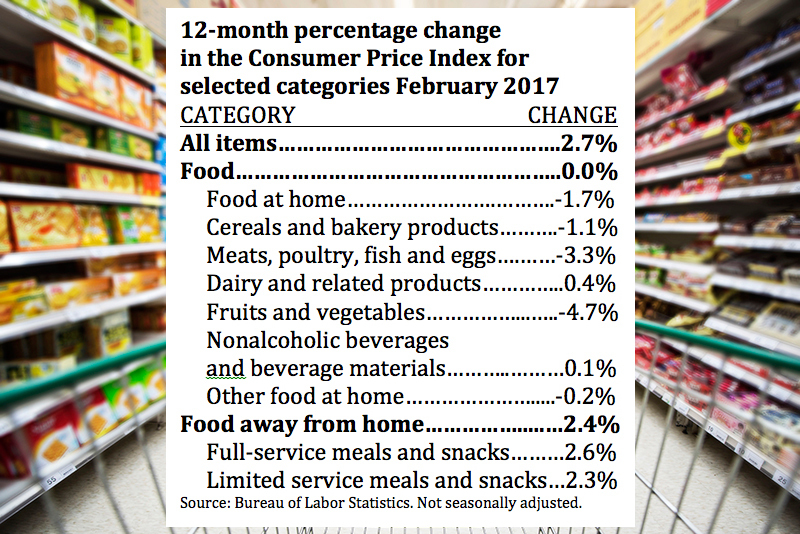 The Bureau’s Food at Home index, a proxy for retail supermarket prices, was down by 1.7% from February of 2016, but better than January’s year-on-year 1.9% decline. It was the 15th consecutive month the index was negative on a year-over-year basis, the longest such stretch since 1950. Although analysts said the February figures are likely to have a modest benefit for supermarket retailers, the news wasn’t entirely positive. The Producer Price Index, released earlier this week, noted that input costs were down from January, suggesting lower retail prices could stick around still longer, Karen Short, an analyst at Barclays, said in a research note. Lower retail prices have put enormous pressure on food retailers to maintain sales volumes and have come in addition to an increased pace of price cuts from Walmart. “Lingering deflation is contributing to what we view as one of the most difficult operating environments in food retail that we can recall. As a result, the extremely challenging operating environment in [the second half of 2016] has likely extended into [the first quarter],” Short said. As compared to last month, the index was up 0.2%, as retail prices held steady or improved in four of six major grocery categories. Only cereals and bakery products and “other” grocery categories (both down 0.4% from January) worsened. Retails for meats, poultry fish and eggs; fruits and vegetables; dairy; and nonalcoholic beverages improved from January. On a 12-month basis, the meat (-3.3%), fruits and vegetables (-4.7%), cereals and bakery products (-1.7%) and other (-0.1%) categories remained deflationary, while dairy and related products showed a 0.4% retail price increase from February of last year and nonalcoholic beverage prices were up by 0.1%. The CPI for food away from home was up by 2.4% on a year-over-year basis, with slightly stronger inflation among full-service establishments (+2.6%) than limited-service counterparts (+2.3%).